A super cheese bread with smoked Gouda, sharp cheddar cheese, white sharp cheddar cheese and parmesan cheese with a hint a black pepper and a kiss of ground chipotle pepper. This is the ultimate cheesy bread with tons of cheese. I love cheese, I put cheese in or on almost everything that I can. I also really love bread. My favorite kind is smoked Gouda. My favorite kind of bread that I found years ago was cheese bread. I've searched for the perfect cheesy bread and I found at chain cafe restaurant. I choose these different types of cheese because I felt that they play well together. Both Cheddar cheeses are tangy, smoked Gouda has a hint of smokiness and the Parmesan has a bite and saltiness that give it a different edge. If you are not into spiciness, you don't have to put in the ground chipotle pepper but the amount in the recipe is a 1/4 of a teaspoon. It's just a kiss of heat at the end of your bite. 1. In a large bowl, combine all purpose flour, bread flour, black pepper and chipotle pepper. Add dry active yeast on one side of the bowl and salt on the other side of the bowl. Dissolve honey or sugar in the warm water. 2. Add two cups of honey water then mix together. Slowly add in the rest of the 1/2 cup to 3/4 cup of water until dough is sticky. Cover and let sit for 15 minutes. 3. Flour a clean counter and knead for 5 minutes. You may need to add more flour as you kneed it. After kneading it for 5 minutes add more flour and cheese a 1/2 cup at a time then knead until the cheese is well mix into the bread. Reserve at least a 1 cup worth of all the cheese. 4. Grease and flour a bowl and cover for 2 hours or until it doubles in size. Once it doubles, divide dough in half, slightly flatten out and sprinkle on some cheese. Roll it tight and place into grease loaf pans and let proof for 1 to 2 hours or until it doubles in size. 5. Preheat oven to 350 degrees, sprinkle on the last of the cheese and brush melted butter on tops. Bake for 30 to 35 minutes, rotating after 15 minutes, brush on more butter.The tops will start to brown so cover after rotating and baking for 10 to 15 minutes more. 6. Let bread cool in pan for 15 minutes then transfer to a wired to cool for 20 to 25 minutes before slicing. If not consuming right away, let it cool completely then wrap cooled bread tightly into clingwrap. Should be fresh for up to a week, if it lasts that long. 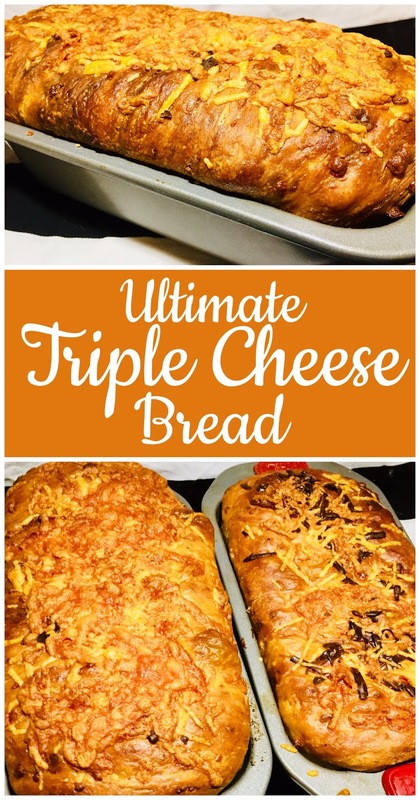 Cheese is my all time favorite and this triple cheese bread looks so delicious. Thanks for the recipe. This bread looks delicious! I bet it could be used for the BEST grilled cheese!! CHEEEEESE! Is there a more perfect food? I think not! I can't wait to try this with my family. We've been making all our own bread for years, but I haven't gotten to the "fancy" breads yet. I will change that TODAY! This recipe is worth trying! Great work. Dang talk about decadence! That would go great with some chili. Bread AND Cheese??? Yes please! Divine combo! Yum! I agree, cheese is delicious on just about anything! This looks like something my husband would gobble up in a second! This is what I am talking about, cheese and bread my favourite things. Oh wow, I really need to try this looks so delicious. I love that this recipe calls for honey. Have you ever tried it with 1/2 whole wheat flour and 1/2 white flour? I haven't tried it with this recipe. I'm sure you can use it but it might not puff up as much. You had me at cheese!! This looks so perfect for pasta night! Never heard about 3 cheese bread but it seems so yum. Very different and rich recipe. I'll definitely tried this. Cheese and bread, two of my favorite things in life. This would go great with a delicious dip or even to pair with Italian dishes. This bread looks amazing!! I absolutely love cheese and am like you - like it in or on everything! Finally found someone who. hands down, loves cheese more than me, lol. oh my gosh, this looks incredible!! I am with you, I love cheese on everything too! My mouth is actually watering. Cheesy bread is my weakness! This looks so good. Need to try this. i've never had cheese bread but it sounds divine! The cheese bread looks super nice. I love the way you come up with new recipe. You are damn creative! This cheese bread looks delicious! Need to try it. Another delicious recipe! Cheese and bread go so well together...and add your favorite wine and that is my kind of night! Thanks for sharing! This looks so good. Everything I love bread and cheese! Oh with smoked gouda??!! YUM!! Smoked gouda is so tasty! And I LOVE parmesan! What a fun recipe! Okay, this looks delish! I love cheese and I love bread so this is a match made in heaven! Yum!!! This looks delish. I love cheese and bread, so I am definitely putting this on my to make list tonight! My son loves cheese bread, we will surprise him next week with this cheese bread, thanks for sharing. Two of my favorite foods- cheese and bread! This looks delicious. Thanks for the recipe! Wow! This cheese bread is so gorgeous! I'd love to make a yummy loaf and use it for grilled sandwiches. Thank you so much for this great recipe! I agree, or afternoon tea. The loaves look great and could be offered 'as is'! Now this is my kind of bread! Cheese on bread is always a good idea. I shall try this recipe! My kids would love this. Probably my husband too. OMG! This bread looks amazing! I will definitely have to try this recipe out! Yum! I love cheese bread and this bread looks so delicious! These look so yummy and delicious! I love cheese bread and seriously cant wait to try them out! This looks really good! Reminds me of something we use to buy at a café here in Norway. This family loves cheese! I bet this is amazing! Bread and cheese are both delicious so this is a perfect combo! Uh yes please! Cheese and bread? You had me at triple cheese! Oh my god, this is something I would feast on till I explode. I love bread (probably because I don't like sweets so that I get my carbs there) and I love cheese, so - send me one! Oh wow, cheese bread is like my ultimate guilty pleasure. This recipe looks amazing! Thanks for this amazing recipe. I love cheese and put it in almost every dish. I am going to try this cheese bread for sure, this is love! While I may not be a big baker I always feel official when I proof something. This bread looks so delicious I would love to try making this! Please pass me a slice or two! I need to give this gorgeous bread a try! The more cheese the better! I seriously need to bake a loaf! WOW! This seriously sounds amazing. Perfect for dunking in a big bowl of soup! YUM! OMG, I'm so making this bread. I also love putting cheese to just about everything I can and Smoked Gouda is a favorite in our house too. So good! This looks so so delicious. Thanks for the recipe, i will share this with my sister inlaw, she will be very happy when she sees this.